On a drippy Tuesday on 53rd street in Manhattan under the shadow of giant corporate bank buildings wrapped in omnious low-lying clouds, a group of forward thinkers gathered at Quest Bookstore. Convergence brought the group together to educate and inspire on the topic of Prosumerism, a new type of social capitalism emerging in this age of conscious expansion. Taking the floor, Kiril Ravensong and Jon Connors posted a question to the crowd: “Who here believes that the government and corporations are going to take care of everything and it will all be fine?” The room burst out in absurd laughter. The truth is, we all have to take care of ourselves, or even better, each other. Prosumerism is proactive consumerism, utilizing the “master mind” group to create a conscious economy where we only give money to people and organizations we believe in. After all, how many of us claim to be against big energy companies or Monsanto but still give them our hard-earned money? Does that make sense? No, of course not, but the distribution channels makes it very difficult to choose otherwise. And that is where Prosumerism comes in. “We are here to help you,” says Jon Connors with intense conviction. “We are a team supporting this new paradigm.” This is not something that will happen overnight, but the seeds have been planted and a community exists to plug into when you are ready. After introducing the concept, it was time to dive deep into some tools and introduce some team members here to spread insight. 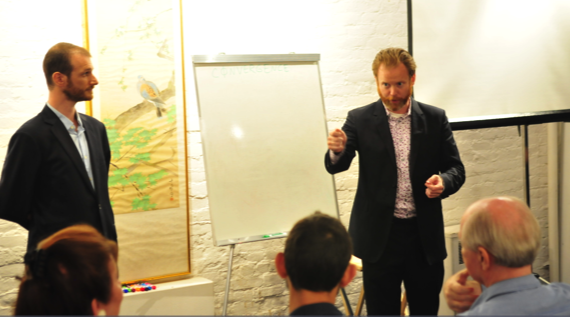 Alexander Dunlop stepped into the limelight next, introducing foundational concepts about what it takes to succeed in this prosumer economy. In order to embrace the concept, there are a few key things to understand. First of all, the prosumer community is largely capitalistic—quite the contrast to the perception that “prosumer” means “commune.” They are very different. Second, one must embrace the entrepreneurial approach. To be successful, one needs to understand all aspects of business administration, specifically marketing, since everyone needs to get their own message out there. Marketing in a freelance entrepreneurial environment means being very present in all interactions to recognize when an opportunity presents itself. Then be empathetic enough to read how to best approach the situation without sounding “salesy” or being pushy. While there are many facets of Prosumerism emerging, the quickest way to get involved is by going to a marketplace to buy your products, curated based on prosumer principles. Ascention Marketplace, also presenting that evening, is dedicated to providing products that support a higher state of living for not only the producer, but also the consumer. Their site is in process right now, and it will be a great resource for those looking to start feeding this positive new economy. Charmaine Waldrop, the other co-founding pillar of Convergence, presented her gift to the world as well, CoCreate Sacred Scents. She uses her knowledge of integrated health and aromatherapy to custom blend essential oils specifically for each wearer. Charmaine not only participates in the marketplace but is integral in organizing the group. It can be frustrating as an awakened soul, navigating life in today’s consumerist, materialist society. It is hard knowing the economy we participate in is run by giant chemical, energy and pharmaceutical corporations with values that may not resonate with our own. Right now, it is time to stop feeding companies that do not share your values. The philosophy of prosumerism is about using your dollars to support organizations & people that you believe in. And it is about finding our own individual craft to contribute to the prosumers out there. 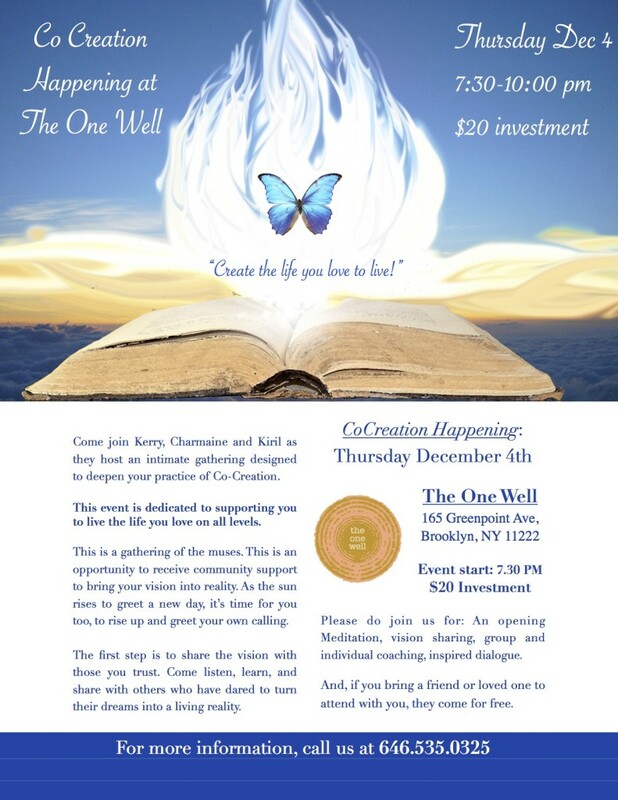 If you would like to learn more, events are taking place in New York City starting this week (December 4, 2014). For more information, check out the flier below, their Facebook page or you can call 646.535.0325.